Never be afraid to dream even if it seems impossible to reach or seems farfetched to others. Every great achievement began as a dream in the mind of a dreamer. On Friday, May 9, 2014, I watched a dream unfold into accomplishment. It only took four minutes and eight second to culminate into reality, but the dream began well over a year ago. Last year the Elkin 4×400 relay team set as a goal to win a state title. It would be no easy task and some would say a pipedream, but I believed in the girls’ dream. I knew it would take at least a year. While we had a good relay team in 2013, we continually ran second to West Wilkes who are always a perennial favorite in our conference. When we ran them we would run fast, but they would always run a tad faster. Then there was Bishop McGuinness, who year after year are favorites to win the state title. We were not yet a threat to them. 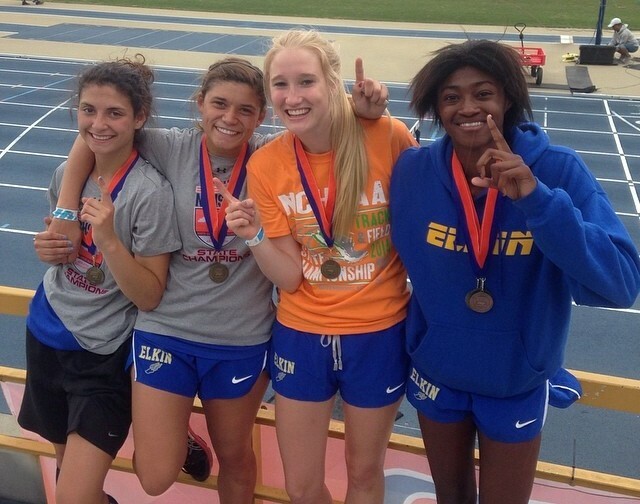 By the end of 2013 Elkin had climbed the ladder to become the fifth fastest 4×4 relay team in the state. Not bad, but certainly not the fulfillment of the dream the girls had. As 2014 dawned Carrie, Payton, Kelsey and Shakai had not lost their dream and their will to work to make it a reality. They were bound as one in their hearts and wills.Their first relay effort of the year in March was a modest 4:37, a long way from the sub-4:10 I knew it would probably take to win at state. But as a coach I love the challenge of helping runners achieve goals that seem unattainable. We chased West Wilkes all season, finally knocking them off for the Conference Title; the girls running the second fastest time in the state (4:19). We were only two seconds behind Bishop for the fastest time in 1A state. At the 1A Midwest Regional Championships we got our first crack at Bishop. We ran five seconds faster than we had run all year (4:14), but Bishop ran one second faster barely beating us to the finishline. We would get one more crack at them at state. There was no doubt in my mind, or the Elkin girls, we would win – you must believe in your dreams! The day of the 2014 NCHSAA 1A State Championship finally arrived. The girls couldn’t wait to run, but it would be a long wait as the 4×400 is the last event of the day. A few more hours were not a long wait as the wait had already been over a year. As the Elkin girls were escorted to the starting line they were brimming with confidence. I knew we would win if our first leg, Carrie, would run 66 seconds, which was two seconds faster than she had ever run. I told her I had no doubt she would do it…and she did! She carried the baton around the track with resolve, purpose and determination in exactly 66 seconds. We were in fourth pla ce as she handed the baton to Payton. Payton moved us up to third, but only a few yards separated the top three at the baton exchange. Kelsey surged down the homestretch to move us into second as she handed off the baton to Shakai, fresh off her winning the state 400 title. It doesn’t hurt to have the fastest 400 meter runner in the state as your anchor leg! Ten yards behind, she quickly made up the difference moving into first place. Shakai shot down the backstretch like a graceful but powerful deer. But the race was not over, as around the last curve the Bishop girl mounted one last charge. Champions don’t give up easily and I didn’t expect anything less from them. But this time their challenge fail short as one last surge by Shakai in the homestretch secured a hard fought victory, Eklin winning 4:08 to 4:10. Even if your dreams seem farfetched and out of reach, pursue them anyway. Grit and determination is the only stairway to new heights. There is no elevator to success; it comes one step at a time. With the Good Lord by our side the dreams He births in our hearts can become a reality. I was moved and touched as I watched the Elkin girls huddle in prayer before they ran. While they had trained hard for this moment, they knew where their true strength and resolve came from. The gold medal around their necks is but a reflection of their gold medal character. My friend, go chase a dream. It will add years to your life and life to your years, and give you purpose and joy in its pursuit.